As Apple Music members, you probably collect so many tracks or playlists you love, but this is just a beginning. 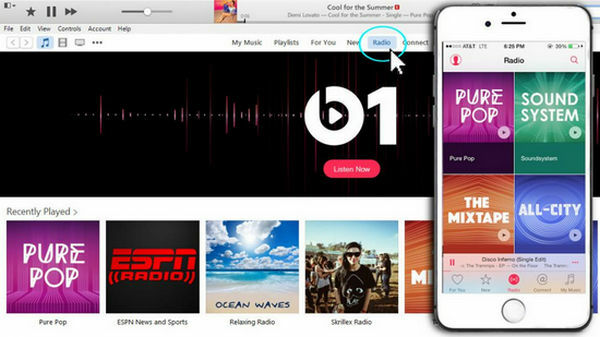 Apple Music, as the most featured rich music streaming service available right now, there are tens of millions of tracks in Apple Music library waiting for you to discover. 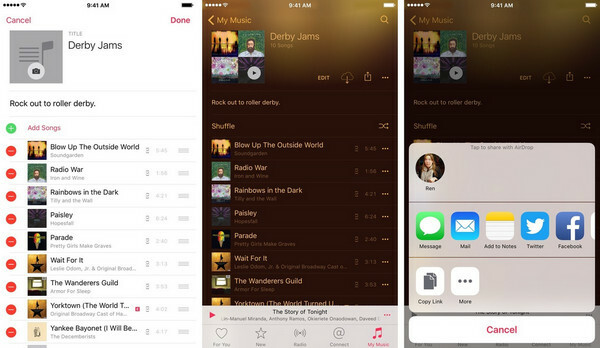 Here this article shares 4 tips to discover new music in Apple Music. Beats 1 is a radio offering service. Alongside new music programs from our anchor DJs, Apple Music invited some of the biggest artists in the world to make some radio shows — from exclusive weekly DJ mixes to interviews with iconic musicians about albums that changed their lives. And Beats 1 is also a global listening experience. It broadcasts over 100 countries from its studios, so no matter where you are or when you tune in, you also can hear the same great programming as every other listener, like exclusive interviews, guest hosts, and the best of what’s going on in the world of music. Apple Music has released an album For You, intelligently used to recommend some tracks to you according to your listening habits, and it can also display lyrics, and Control Panel. Apple Music will keep track of what you’re searching, what music you’re “loving”, and what music you choose to add to your library. 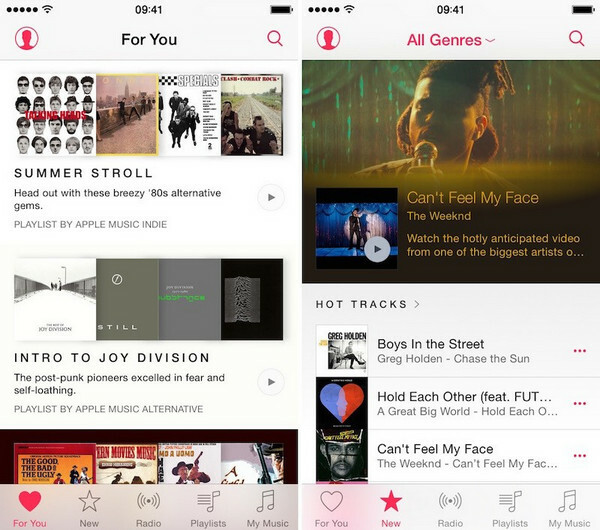 “The more you explore, the better Apple Music gets.” All those suggestion will show up in For You section. Just keep refreshing it every now and then. If you want to listen to the newly released tracks or albums on Apple Music, “New” tab is the best place you should go. 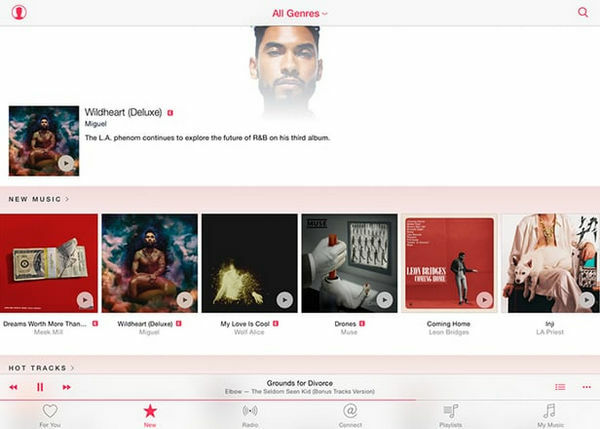 You can sort by genres and Apple will show you the top songs and albums along with what’s hot in that week. Connect is a place in which musicians will give their fans a closer look at yo their work, inspirations, and their world. For example, musicians can post songs and videos to enhance existing albums in their discography. Which gives you a chance to gain more insight into the meaning of songs, discover sources of inspiration, and get greater depth and more context about music you may have been listening to for years. On the other hand, you can comment or like anything an artist has posted, and share it via Messages, Facebook, Twitter, and email. And when you comment, the artist also can respond to you directly. Or if you have any other tips for disconvering more tracks or playlists, just share with us. Because Apple adds DRM protection to all Apple Music’s tracks, if you cancel the subscription from Apple Music, you have no access to play any streaming music you've added or downloaded to your library for offline listening. So can you keep these new Apple Music tracks playable without limitation from Apple Music? The answer is absolutely "Yes". All you need to do is removing the DRM protection of these tracks or playlists and NoteBurner Apple Music Converter makes it possible.